From the acclaimed Cachapoal Valley, this Carmenere is an intense dark purplish red. Its singular aromatic concentration delivers red fruit notes with touches of black pepper, coffee and sweet oak hints. In mouth, this wine displays rich flavors, together with ample, ripe and velvety tannins. A structured and friendly Carmenere. 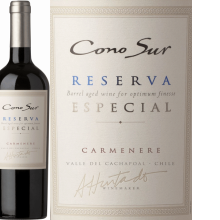 Food Pairing : Our Reserva Especial Carmenere is an excellent choice for red or white meats, pastas, pizza, spicy dishes and cheeses. It goes great with dishes such as meat croquettes, legumes, veal, glazed pork leg, rice with nuts and stuffed mushrooms.